Paragon ID is pleased to announce that it has signed a partnership with Wizway Solutions, a leading player in the digitisation of tickets on NFC (Near Field Communication) smartphones. 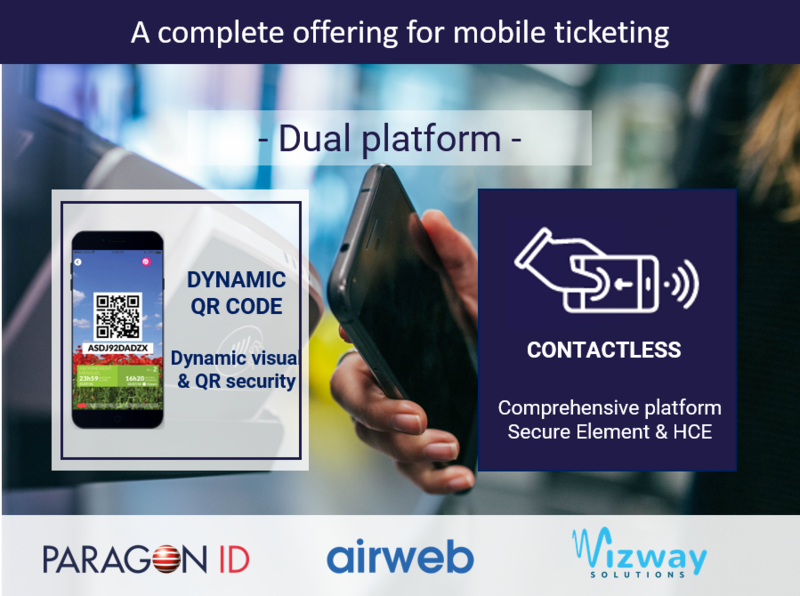 Just a few weeks after the announcement of its strategic investment in airweb, Paragon ID announces a partnership with Wizway Solutions which completes its digital offering for mobile ticketing solutions required by a growing number of transport networks and cities. Paragon ID’s technologies are particularly strong in the digital front end where the applications and remote sales platform, accessed through its strategic investment in airweb, combine with its own secure, software solution NFC/HCE (Host Card Emulation) to provide a technical offer which is unrivalled in the market today. For larger transport networks, which require secure contactless NFC ticketing solutions, Paragon ID’s HCE solution will be integrated in Wizway Solutions’ suite of digital services to allow all NFC-enabled smartphones to act as a contactless ticket. For smaller and medium-sized transport networks, airweb’s dynamic QR code service will provide a highly adaptable digital ticketing solution with fast implementation. Wizway Solutions was born from the shared vision of four key market players - RATP, SNCF, Gemalto and Orange – of making contactless solutions accessible to all. The company, which announced its partnership with Samsung last week, is the sole industrial player in Europe providing a comprehensive NFC platform, having access to hardware security solutions (such as the Secure Element embedded in Samsung smartphones) and software security solutions with Paragon ID technology. Extending its partnership to Wizway Solutions gives Paragon ID - already a world-leading supplier in smartcards as well as magnetic and contactless tickets - the opportunity to offer the most comprehensive mobile ticketing offer in the market, tailorable to the specific needs of its customers. It also opens doors to new markets in emerging countries. “We are very happy to partner with Paragon ID, a company already recognized for its know-how in transit ticketing, security and successful implementation of HCE solutions. Wizway Solutions will widen the scope of its comprehensive industrial platform, to provide contactless mobile ticketing to an even larger number of travellers and transit operators." Wizway Solutions is the French leader in digital ticketing on NFC Smartphones. Aimed at simplifying contactless transport, Wizway offers a global solution for the digitisation of transport cards and tickets on NFC Smartphones that has already been taken up by the main transport networks in France. For further information about Wizway Solutions, visit Wizwaysolutions.com. For more information about our mobile ticketing offering, fill in the form below.